It's been a while since I promised to post the results of our Easter egg project, but between us all having chest infections (which is particularly not fun as little Toby already has sleep apnoea) plus me trying to get ahead and finish my OU assignment, I've been even more strapped for time and energy than usual in the evenings. Anyhow, here it is :) The idea was suggested by Natalie, and the instruction's she found for it looked really straightforward, with a really appealing looking end product: Take one water balloon and a mini egg. Insert mini egg into water balloon and blow up partially, so it is the size of a hen's egg. Mix equal parts PVA glue and water. 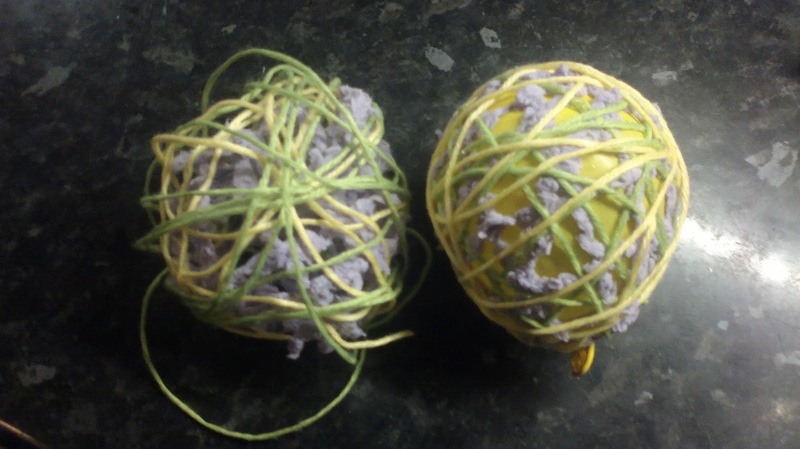 Dip a length of string in this mixture and wind it round the balloon. Repeat with more string, making a mesh. Allow to dry, then pop the balloon. Hey presto, an adorable egg inside an egg gift is born. I think I went wrong from stage one, when I used regular balloons because I couldn't find anywhere selling water balloons. I blew them up as small as I could, but as you can see from the picture, any hen trying to lay an egg that size would have been shouting for an epidural! I started off with really short lengths of wool, because I thought the boys would find these easier to handle, but they just slid off. Second try with longer lengths worked well, with quite a bit of help for Ollie. Toby is going through a stage where he doesn't like sticky or dirty hands, and so protested about the glue until I gave up and gave him just dry wool to play with. Ollie really enjoyed winding the wool around. He said he was making a spider web egg. So far so good (see the second picture). The next day when the wool had dried out it was all looking very promising, and Ollie had great fun popping the first balloon with a skewer (and close parental supervision!). Our poor egg promptly collapsed in on itself. We went wrong somewhere that's for sure, and I think the most likely candidate was the size of the balloon. I think I will up the percentage of PVA in our mixture next time to be on the safe side too. A great thing about doing craft projects with kids is that the outcome is generally less important than the process. Ollie got a lot out of measuring out the glue and water and stirring it, and both boys were really taken with the wool. Toby draped lengths of it across his face and head, enjoying the different textures of the fluffy and smooth wools. 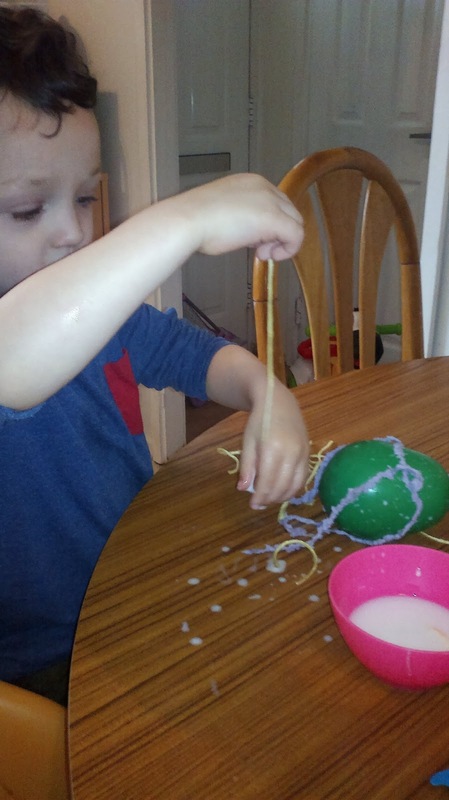 Once the wool was dipped in glue, Ollie was the only one who was keen on it, but repeated chances for messy play for both the boys is really important. Even the failed eggs aren't a waste as the slightly crispy wool has gone back in the craft box to be reincarnated at some future time as a nest, or hair, or a spider web. Don't be sorry, it was great fun :) Keep the suggestions coming! 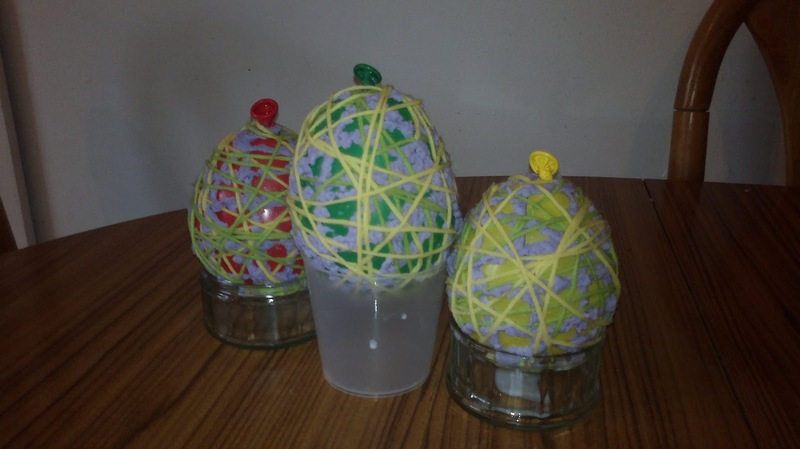 we're trying this as well for Easter presents for people, and are on the third attempt, now using wool and will be lubing the balloon as we couldnt get water balloons either. We will get these done, and they will look fantastic!!! !